FM transmitters allow you to listen to music, podcasts, and audiobooks you have on your handset via your car’s speakers. Just plug one into a vehicle’s power outlet, pair it with your device with the help of Bluetooth or a 3.5 mm auxiliary cable, and you’re good to go. In addition to keeping you entertained while on the road, FM transmitters can let you make and receive calls, while some of them also double as chargers for your mobile devices. They are affordable as well as easy to install and use. They come in all shapes and sizes, with some being better than others. In this post, we’ll take a look at a some of the best FM transmitters you can buy. Let’s dive in. This FM transmitter doesn’t support Bluetooth, so you have to connect it to your smartphone via a cable. It comes equipped with a small display and two buttons for adjusting the frequency. The device also features a USB port, allowing you to charge your mobile device while on the road. The FM transmitter is backed by a 6-month warranty and comes in four different colors: black, gold, silver, and rose. Price depends on the color option you choose, with the cheapest variant going for $12.99, while the most expensive one will set you back $16.49. Just keep in mind that as a wired connection is required, the product is not compatible with smartphones that don’t have a headphone jack (HTC U11, Moto Z2 Force…). Tecknet’s product is quite similar to the one described above, as it also doesn’t support Bluetooth. To set it up, you have to plug it into your car’s power outlet, connect it to a device with the 3.5 mm auxiliary cable, and then tune your FM radio to a clear frequency. The product also has a USB charging port and sports a small display with one button on each side. However, it does have a different design, comes with a longer 18-month warranty for peace of mind, and is slightly cheaper. You can get it on Amazon for $11.99 via the button below. The FM transmitter made by Nulaxy is one of the most popular options on the market, and for good reason. You can pair it with a device via Bluetooth or an auxiliary cable, or just insert a microSD card with your favorite songs on board. The device has a 1.44-inch display that can show things like the song currently playing, and sports a couple of buttons allowing you to skip tracks as well as take calls, among other things. It also features a USB port for charging your device and is equipped with a microphone. The product comes in a total of six different colors with pricing starting at $17.99. Despite its compact size, this product is packed with features. It connects to your device via Bluetooth and allows you to play music as well as take and receive calls. The product is equipped with a small display, a microphone, and buttons for skipping tracks. It also has dual USB ports, so you can charge two devices at the same time, and can play music from a microSD card. Lihan’s FM transmitter comes in black and has a glossy design that’s quite easy on the eyes. It doesn’t cost an arm and a leg, as it retails for $17.99 on Amazon. 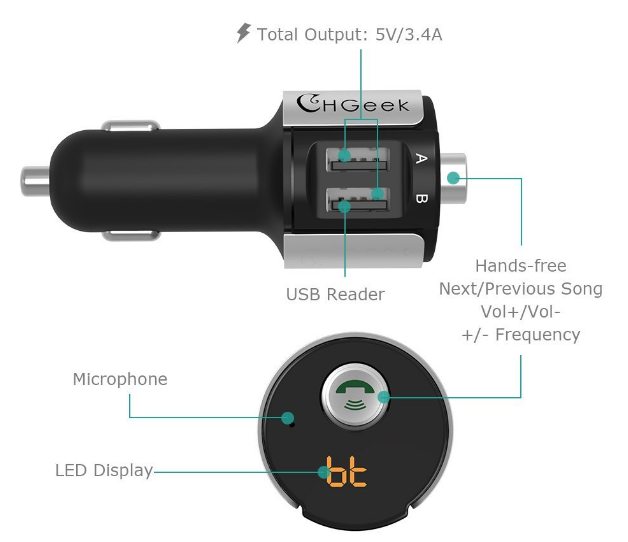 CHGeek’s FM transmitter has a very simple and minimalistic design but is still capable of playing music via Bluetooth as well as charging two devices at the same time. It only has one button that allows you to pause and skip tracks as well as adjust the volume. You can also answer calls with a single press and dial the last number by pressing it twice. The product sports a small display up front that can show the voltage of the car’s battery and is also equipped with a microphone. It’s currently listed at $18.99 on Amazon. This FM transmitter is capable of connecting to your smartphone via Bluetooth or a cable and can also play songs from a microSD card. It offers a 1.44-inch display that shows you various info including the name of the track, the incoming phone number, and more. The device sports a few buttons you can use to answer calls, skip songs, and so forth, and has a flexible metal hose that allows you to move it in different positions. The product also features a USB charging port, comes with a 12-month warranty, and will set you back $18.99 or $19.99 depending on the color. The Anker Roar is a Bluetooth FM transmitter that allows you to stream music to your car’s speakers as well as make and receive calls. It has three buttons you can use to skip tracks, among other things, and also features dual USB ports for charging two devices simultaneously. It’s equipped with a small display and has a black body with a few orange details that make it a bit more noticeable. You can pair it with Anker’s Roav app that logs the status of your battery every time you start the car, helps you remember where you parked, and more. It’s the most expensive product on this list with a price tag of $29.99. So that’s it for our list of best FM transmitters. We are sure there are a number of other great options on the market, but listing them all would make this post way too long. If you think we have missed any major ones, let us know by posting a comment down below. We always love getting feedback from you guys.